Equipment: Audio Equipment. Washing Machine. Microwave. Coffee Maker. Building amenities: Solarium. Patio. Colonial Style. 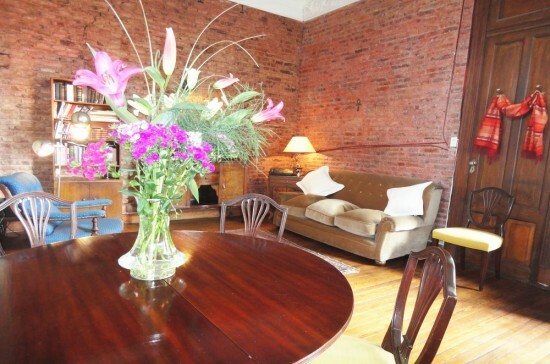 Stylish apartment, located in an antique building on Defensa street. On the first floor: the main bedroom with a double bed, a desk and a large wardrobe. Also, the bathroom with a bathub. Finally, a private terrace with tables, chairs, and plants. Valid offer to stay from 3 months. This was great! Our host met on time and was prompt about checking us out. She even left us a goodie bag of wine and snacks when we arrived and then made sure we were in a taxi and on our way home before she left. The apartment was beautiful (especially the view from the upstairs patio). We had friends staying in Palermo at the same time, but we didn\'t have any trouble convincing them to come down to us. The neighborhood was very funky. Exactly what I would expect from my visit to Buenos Aires. I especially enjoyed that the apartment door opened right into the San Telmo market on Sunday. We had a great time in the apartment! Beautifully furnished, lots of lovely plants in the outdoor area. Highly recommended. Hello to everyone, I have only praise for the people and the apartment. Everyone and everything was very nice to deal with and the apartment was a high light, I would like to see that everyone has a great time with these people Thanks for the best way to enjoy the city.